Make in India: A Distant Dream? It's been over two years since 'Make in India' campaign was launched. The markets were optimistic about the theme. And it did help various participants spice up India's growth story along with that of the company they were trying to sell. But has India really delivered on the big promise? Our meetings with the managements do not suggest so. Whenever we ask the managements if they really see Make in India drive making a difference, the response usually is: "We have been hearing about it in the media, but yet to see its impact on the business." Unfortunately, historical statistics suggest the same. As per the World Trade Organization data for International Trade, India's share in total exports of manufactures stands at just 1.6%, compared to 18.6% for China. Japan and US account for 4.7% and 8.7% respectively. 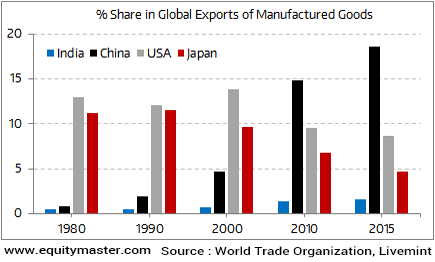 Post 1991, integration with global economy has raised the share of manufactured exports. Yet, the share of manufacturing in GDP has remained constant since 1980. In fact, value added share in Indian manufacturing is declining. As suggested in the article in Livemint, ironically, higher integration has also led to higher imports of processed industrial supplies. So, we are importing more from the world than exporting to it. So how can India rise to its true potential? The answer lies in looking beyond the hype of low wages and demographic dividend and put them to use by improving the investment climate and in the country. At a time when the world is progressing more towards protectionism, India needs holistic reforms rather than jingoistic rhetoric to become the factory of the world. Equitymaster requests your view! Post a comment on "Make in India: A Distant Dream?". Click here!